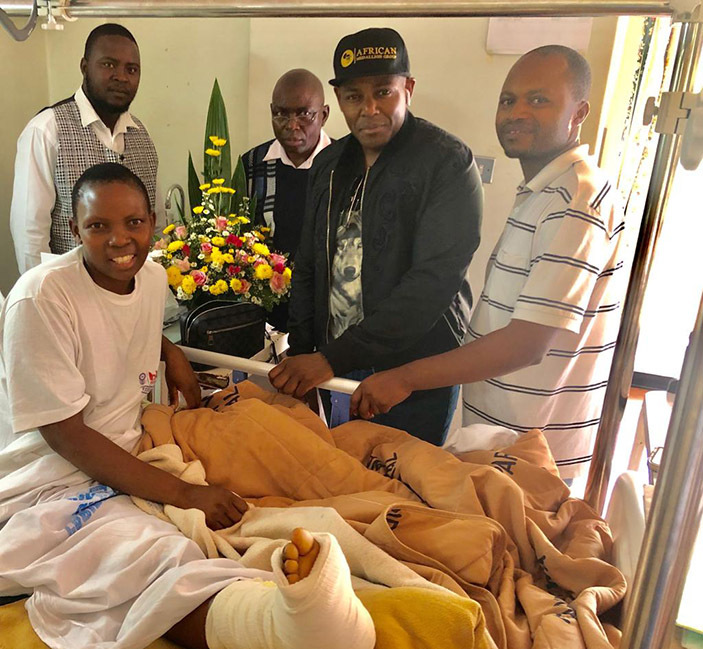 THE African Medallion Group owned by South Africa-based Zimbabwean businessman, Frank Buyanga, last week visited some of the people injured during the recent violent protests, as part of its pledge to assist the victims. Buyanga recently pledged to help violence victims in need of medical attention and burial assistance for those who lost relatives. At least 1 055 people have appeared in court for looting, public violence arson, malicious damage to property, assault and murder, among other crimes. According to AMG their announcement last week was a non-political humanitarian programme to help victims of violence and was a helping hand, not a begging hand. In a statement, AMG chair Estee Mamman thanked the Government and various stakeholders for the assistance they had provided so far to the victims of the violence. “African Medallion Group would like to thank everyone for the tremendous outpouring of help, assistance and kindness that was shown to the people of Zimbabwe. Your support and effort are truly appreciated. To each and every one of you who are reading this, and taking an interest in the work that we do, thank you. “Additionally, we would like to extend our thankfulness to the President of Zimbabwe, Emmerson Mnangagwa, who has promised justice for the victims of violence,” she said. She said last week, they visited some of the victims and assisted some of them to get medical treatment, including settling their bills. “We were deeply saddened by the violence that took place in our beloved nation of Zimbabwe. Last week, the media publicised our humanitarian program to assist those affected by the violence. Thank you. “This is just but one of our humanitarian efforts to build a better Africa. We may not always be politically correct in our approach but our ideals remain focused on helping develop the country and fellow countrymen. “Our announcement last week was a non-political humanitarian programme to help victims of violence. This is a helping hand, not a begging hand and it is extended as means to uplift Africa. We remain committed to assisting those who approach us for humanitarian assistance,” Mamman said. She said in 2015, through their partner establishment, they helped people and other African brothers and sisters from Mozambique, Malawi and the Democratic Republic of Congo that had come under siege during the well-publicized xenophobic attacks in South Africa.